In Álava, in the heart of the Rioja wine region, is a famous winery that’s over 100 years old and produces one of Spain’s most distinguished wines. And its building is one of the most iconic in the region. The winery we’re talking about is Marqués de Riscal. 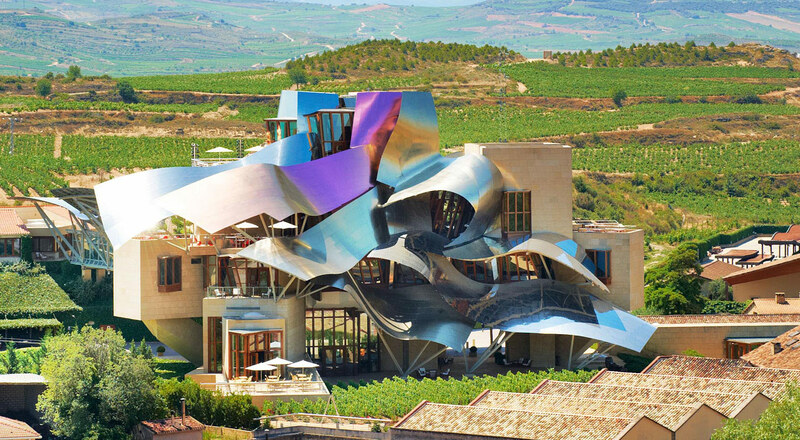 Since it opened in 2006, this remarkable building has established itself as a landmark of modern architecture, a place of pilgrimage for wine lovers, and a symbol of Marqués de Riscal wines. The area contains the ‘City of Wine’ located in Elciego, Álava, in the heart of the Rioja region. The man behind this magnificent, inspiring work is the Canadian architect Frank Gehry (b. 1929), best known for his work in the Guggenheim Museum in Bilbao. The initial brief was to mark a before and after in the way we perceive the world of wine. That meant unifying different concepts in a single building—tradition, passion, innovation, modernity—while also expressing the spirit and the essence of a winery that’s over 100 years old. The building rises through a succession of unique and highly irregular floor plans, each level slightly less irregular than the one below it. It’s carried on three massive columns planted in the cellars of the Marqués de Riscal winery, and offers incredible views over the surrounding vineyards. Frank Gehry has won many awards for his talent, innovation, creativity and ability to re-think existing spaces. He won one of Spain’s most prestigious arts awards, the Prince of Asturias Prize, in 2014.